This little project is special because of the way it was conceived. Its design, visuals, and name, all come from a dream. 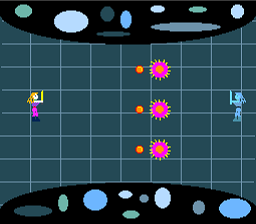 I had spent the previous evening thinking about what game to make next, but I couldn't come up with anything. It's not really a complete game, but that's the point. It didn't make sense in my dream, so that's how I'm making it here. Programming the TurboGrafx-16 (called PC Engine in Japan) was decently easy. In fact, the HuC compiler allows for the easiest to use image/palette loading methods I have seen. On the other hand, it expects source code to follow the old ANSI C standard, with the crazy function definitions with the types of their arguments specified between the argument list and the function block. Also, no single line comments, no variable initialization and declaration in a single statement. I hacked this together this in about a day, so its code quality isn't great. 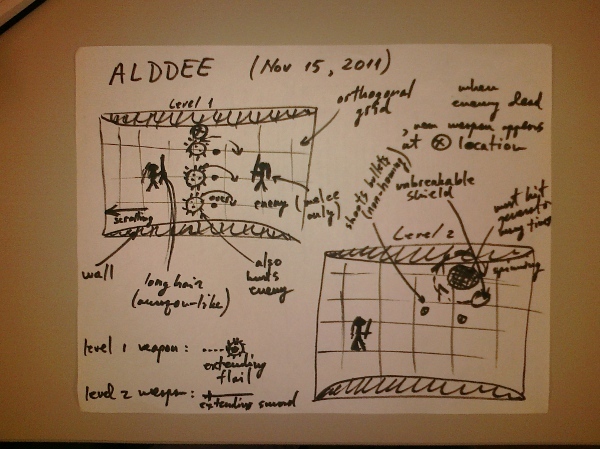 source code - the source code for Alddee. I admit it's a bit messy, but I think it shows the basic elements needed to code a game on this platform. development kit - the entire HuC dev kit. It contains all you need to develop for the TurboGrafx-16. It contains the source code for Alddee, along with a bunch of other sample projects. All projects are found in the source directory. Their makefiles assume the dev kit is installed in C:\huc The kit also contains the xpce emulator. emulator - a nice TurboGrafx-16 emulator. It is in Japanese, but since it doesn't have a myriad of options, it is pretty easy to use.